Today is a small victory. You all did it. Let's not break camp, let's not go home. We need a thorough analysis of what the denial of the easement means. Chase Iron Eyes: You must remember the Chairman is concerned about Protectors safety, don't fault him. He is the chairman and he's looking out for all elderly, disabled, children and others at the camp. If you are not self sufficient and able bodied you should seek shelter & an exit plan because you may be more of a liability than an asset in this climate . But if you're ready and able please stay. We are going to work hard to make sure people are safe. There are 1000s properly winterized, strong enough to stay thru the winter. I, Chase Iron Eyes, a citizen & resident of the Standing Rock Nation, would invite all people who have travelled 1000s of miles to continue to stand with us, to stay in our Treaty Territory at our invitation until this pipeline is dead, until DAPL & Law Enforcement are gone. I am extremely grateful for your sacrifice and the children of our Nation are indebted to you. 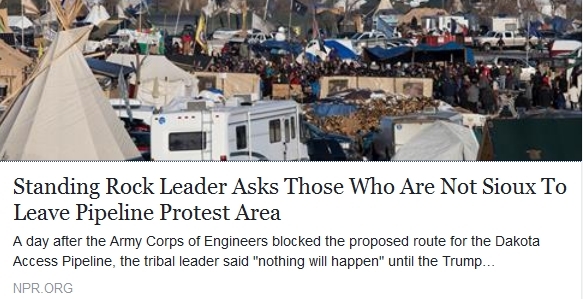 Water protectors are here at their own risk. Government entities are absolving themselves of liability. Stay at your own risk, your own care, you can easily freeze to death if you don't have proper shelter & heat sources, but This is the time. We may never get another opportunity to change our destiny. We deserve a better way. *All Due Respect to our Chairman, maybe he was misquoted or they're trying hard to drive division. Chase Iron Eyes: The Army Corp denial of the easement means nothing until all law enforcement is gone, until DAPL is gone. Let us strengthen our presence. 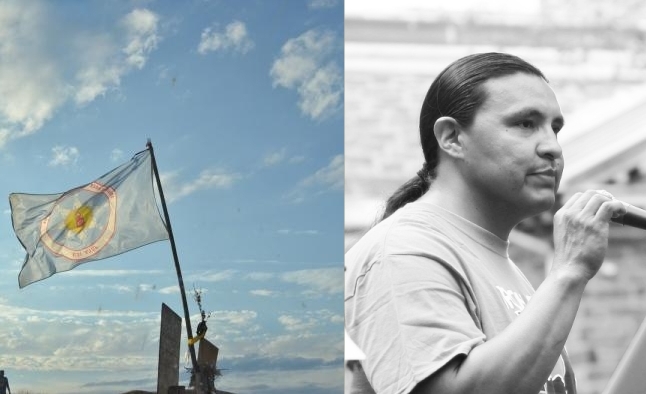 Chase Iron Eyes: Some people have left camp because of the deadly weather. More have arrived. Everybody is being advised to go to a safe shelter. No one should sleep in tents. We are pulling together to make sure you all have warm places to sleep. Chase Iron Eyes: Oceti Sakowin treaty camp security have informed me that they have made rounds to every tent earlier, and all have been advised to sleep in the dome, the cannonball red gym and the pkc pavilion. These guys are heroes! If you have someone at camp those are the places to sleep in emergency times. Chase Iron Eyes: We are not leaving. Period. We need to make a stand for our Treaty rights, now is the time to renegotiate our Treaty, our government to government relationship, grinding, debilitating economic, political & legally imposed poverty culture just doesn't seem to be working. WHAT IS NEXT: We need to make a treaty stand. Other Treaty Tribal Nations need to weigh in now. We have an emergency situation that needs dealt with with the winter & we need to kill this project. The USACE Denial of the easement is NOT a victory. Responses to "Chase Iron Eyes from Standing Rock corrects misinformation from mainstream media"
Stay, and stay strong and united! I believe they are trying to deceive you and I am watching and praying for you all from Australia.